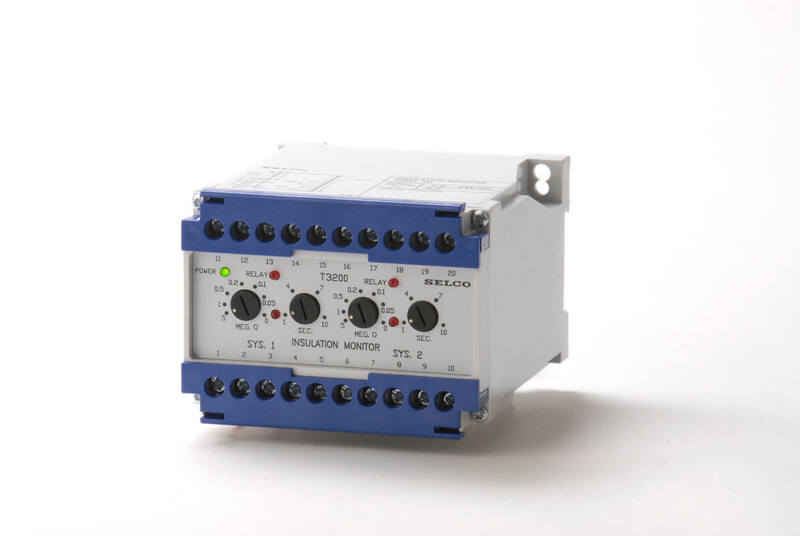 The Insulation Monitoring Relay T3200 is intended for continuous insulation monitoring on 3 phase insulated networks on board ships. The relay continuously monitors two systems galvanically separated from each other, e.g. the busbar and the lighting system or two busbar systems. The Insulation Monitoring Relay T3200 is intended for continuous insulation monitoring on three phase insulated networks on board ships. The relay monitors continuously two systems galvanically separated from each other, e.g. the busbar and the lighting system, or two busbar systems. The unit features two output relays for alarm purposes and two analogue outputs for instrument reading. The instrument is not included with the relay. Instruments are available from SELCO as standard sized switchboard component.